Gourmet News is published by 11 a.m. each Monday. To send news releases, see below. Hershey’s New Antioxidant Chocolates. 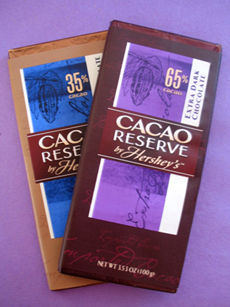 Last week we wrote about Cacao Reserve by Hershey’s. If that new product line didn’t hit one out of the park, here’s something new for your consideration: We’ve heard for the past few years that the cacao bean, the seed of the fruit of the Theobroma cacao tree, is one of the most concentrated sources of healthy flavanol antioxidants. The higher the concentration of cacao (i.e., the darker the chocolate), the more flavanols. Now, milk chocolate lovers can have their own high-antioxidant chocolate: Hershey’s Antioxidant Milk Chocolate has been created with more antioxidant capacity (ORAC) than the leading dark chocolate bar. At 260mg of flavanol antioxidants per 40g serving (1.4 ounces) versus 110mg in the leading dark chocolate, it offers the flavanol equivalent of 3 cups of green tea—although, of course, green tea has a calorie value of zero, compared to close to 200 calories for the chocolate. The added flavanols have no taste or caloric impact on the chocolate. There has been no study that specifies exactly what daily amount of cacao flavanols is required to sustain the health benefits from the cacao bean (whereas, e.g., 8 cups of green tea per day have been cited as the appropriate threshold). 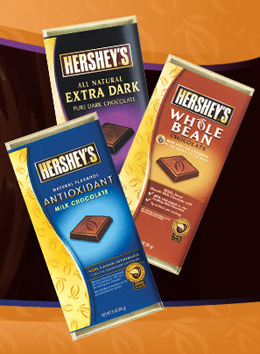 Hershey’s Antioxidant Milk Chocolate is part of the Hershey’s Goodness line (photo above), which can get confusing as you decide what type of “goodness” to go for. Do you want the added antioxidants in the Antioxidant Milk Chocolate Bar? Or might you prefer a related bar—Hershey’s Whole Bean Chocolate, a milk chocolate bar with 40% less sugar than the leading milk chocolate bar, high fiber (7 grams per serving) and higher antioxidants (180mg of flavanol antioxidants per 40g serving)—but not as high as Hershey’s Antioxidant Milk Chocolate? How should you choose one over the other? Or, if you’re in it for the antioxidants, should you learn to love the Extra Dark Pure Dark Chocolate, which has 480mg of flavanols per 40g serving? That’s much more than the Antioxidant Milk Chocolate, yet the label lacks any prominent “high antioxidant” labeling (perhaps a revised label is in the works). Frankly, it’s a puzzlement: We, professional chocolate writers, had to sit down and study the bars to figure out which way was up. Will most consumers be even more puzzled and default to a simpler chocolate bar? After all, it’s candy, not nutraceuticals! 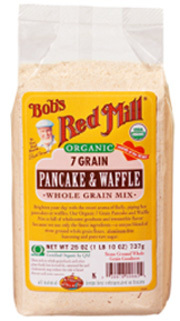 Easier Organic Breakfasts With Bob’s Red Mill. One of our favorite purveyors of quality grains (see our article on Whole Grain Breakfast Cereals) has reformulated its pancake mixes to include organic ingredients, with three of the mixes USDA-certified organic. Each mix includes organic stone ground whole grain flours, aluminum-free leavening, and organic raw sugar. Made with stone ground organic ingredients and whole grains, these products taste like the kind of old-fashioned quality food it’s tough to find—except that Whole Foods Markets and other fine stores carry the line, and you can order it online from BobsRedMill.com. The three USDA-certified mixes include Organic 7 Grain Pancake and Waffle Mix, with a unique blend of seven stone ground whole grain flours; Organic High Fiber Pancake and Waffle Mix, with 5 grams of fiber in each serving and an ingredients mix that includes stone ground oats, nutrient-rich flaxseed, wheat germ, oat bran and wheat bran; and Organic Cornmeal Pancake and Waffle Mix, made of grain cornmeal, stone ground whole wheat pastry flour and oat flour. The Buttermilk Pancake and Waffle Mix is now made with organic flour (and real buttermilk for a classic pancake taste), and Buckwheat Pancake and Waffle Mix blends organic whole grain buckwheat and wheat flours. If you’d like some organic syrup with that, read our article on organic maple syrup. Beer With Attitude. If your dad loves beer and attitude, you might want to grab a bottle of Flying Dog Brewery’s Whiskey Barrel-Aged Gonzo Imperial Porter. Sold in 750ml Champagne bottles like the one at the right, finished with a cork and cage. The new beer is the latest addition to the brewery's “Wild Dog” Series, a portfolio of high-gravity, experimental beers that are “are big beers with big attitudes, and if you don't show the proper respect they will bite back!” The unique porter was brewed and transferred into charred White American Oak whiskey barrels that were used to age whiskey by neighboring Stranahan’s Colorado Whiskey. After aging in the wood barrels for three months, Imperial Porter was hand-bottled, corked, labeled and conditioned for another six weeks. According to the brewery, the flavor notes include sweet chocolate, dry oak and smooth whiskey. Only 5,000 bottles were packaged, and there are 500 Limited Edition Wild Dog Gift Box Sets that include a Champagne bottle of the porter, a Wild Dog glass, a collector’s button and an authentic piece of the wood barrel used in the aging process (which still holds the great aromas from the whiskey and beer that aged in it). Flying Dog is Denver’s largest brewery and the second largest craft brewery in Colorado. Their award-winning “litter of ales” is available in 45 states. If you’re in the neighborhood, the Brewery is located at 2401 Blake Street, just 2 blocks north of the baseball stadium. Tours are given weekdays at 4 p.m. and Saturdays at 1 p.m. and 3 p.m. Hunter S. Thompson, the famous gonzo journalist, had a hand in the brewery’s development, and the beers are easily spotted on the shelf thanks to gonzo artist Ralph Steadman, the packaging designer. For information on brewery tours or events or to find a retailer near you, call 1.303.292.5027. FlyingDogAles.com. Steaz: The First Organic & Fair Trade Energy Drink. Steaz, makers of some of our favorite organic green tea sodas, has introduced the first USDA Organic and Fair Trade Certification, Steaz Energy, in 12-ounce cans. True to the brand’s heritage, the drink is carbonated and contains green tea, but has a carbonated berry “energy drink” profile that is sought by many people looking for that adreneline rush. In fact, since the introduction of energy drinks in 1999, the sector has been growing at about 68% per year. Most contain high fructose corn syrup, artificial sweeteners, preservatives and additives. There are delicious, all-natural alternatives such as Inko’s and Hiball (which has no sweeteners—read our review), but Steaz, sweetened with organic cane juice, is the first to hit the dual certifications of organic and Fair Trade. Eat Your Veggies. What can we do: after generations of nagging, Americans are still not eating enough vegetables—or fruits, either. Since 1990 the Dietary Guidelines for Americans has recommended at least two servings of fruits and three servings of vegetables daily—an easy enough program to follow—we simply haven’t been doing the math. Two studies published in the April issue of the American Journal of Preventive Medicine cite this is a serious public health concern, because consuming a diet high in fruits and vegetables is associated with decreased risk of obesity and certain chronic diseases, such as cardiovascular disease, diabetes and some cancers. 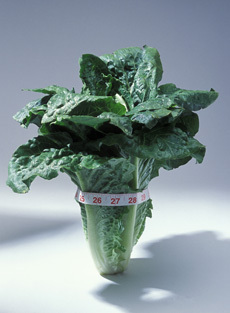 Researchers from the Johns Hopkins School of Public Health and the Welch Center for Prevention, Epidemiology, and Clinical Research in Baltimore analyzed National Health and Nutrition Examination Surveys covering almost 15,000 adults to determine trends over time for fruit and vegetable consumption among American adults. Despite the 5-A-Day campaign and other marketing efforts, Americans have not increased their consumption, with just 28% and 32% meeting USDA guidelines for fruits and vegetables, respectively, and less than 11% meeting the current USDA guidelines for both fruits and vegetables. Approximately 62% did not consume any whole fruit servings and 25% of participants reported eating no daily vegetable servings. Cacao Reserve Sales Are Reserved. Cacao Reserve by Hershey’s, the premium line launched by the giant chocolate producer six months ago, has not soared into the sales stratosphere. We like the line very much and think it’s a terrific opportunity for many people to upgrade to a better chocolate bar. But while the premium chocolate category overall is growing at a healthy pace, in the almost six months post-launch, industry magazine Ad Age reports that Cacao Reserve sales are slow. The difference seems to be one of brand perception: while names like Lindt and Ghirardelli have always stood for a premium product, Hershey’s has always been Everyman’s bar. Thus, selling a premium bar bearing the Hershey’s name has not proved to be an effective strategy (can Ford introduce a luxury car to compete with Mercedes and Lexus?). Hershey’s intends to make it work: The company has reduced the regular $2.49 retail price to two bars for $4.00, and it will run high-value coupons along with a large-scale TV and print campaign. New packaging will offer four different assorted Cacao Reserve pouches with a variety of chocolate tasting squares, including dark chocolate and single-origin chocolates. We like Cacao Reserve: it has a charred profile that Starbucks-lovers should enjoy. Read our review of the Cacao Reserve line. Lesser Evil’s Greater Sales. In less than twenty months from its inception, Lesser Evil’s first snack line, All Natural Kettle Corn, has become the #1 popcorn brand in the natural food stores. The company was founded by a former Former COO and CMO of Snapple Beverage Group. The strategy—to connect with the better-for-you food trend and simultaneously capitalize on an unmet need for snacks that taste great and are made with “less evil” ingredients—has paid off. Now, the company has introduced its second line, Krinkle Sticks—potato sticks that look like curly fries, in BBQ, Cajun, Sea Salt and Sour Cream & Onion. At 110 calories per cup, they have 75 percent less fat than regular potato chips; and are free of trans fats, saturated fats, cholesterol, preservatives and gluten. 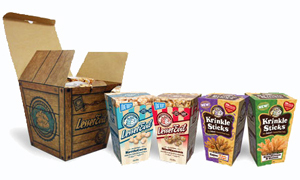 Lesser Evil snacks are sold nationally in natural retailers like Whole Foods and Wild Oats, as well as at mass outlets such as like Costco, Best Buy and Amazon.com. Read our review of Lesser Evil popcorns. 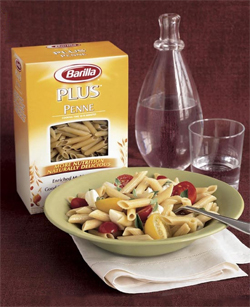 Barilla Plus. Recently we made up a pasta salad using penne from Barilla Plus, the leading pasta producer’s multigrain line that is enriched with Omega 3s and a legume flour blend of lentils, chickpeas, egg whites, spelt, barley, flaxseed, oat fiber and oats (it’s mixed with the standard durum wheat semolina). It’s also enriched with folic acid, iron, niacin, riboflavin and thiamine mononitrate. The pasta is delicious, and no one who ate it could tell the difference. Multigrain pasta provides effortless better nutrition and can especially help help kids, who love pasta, eat healthier. In fact, the Barilla folks tell us that state governments are mandating that schools serve multigrain pasta. One 100g portion of Barilla Plus provides 30% of daily value of protein (somewhat more than traditional value), plus 28% of daily value of Omega 3 (not found in traditional pasta) and 28% of daily value of fiber, 7 times that of regular pasta. The pasta tastes the same, but has a better chew. For more information and recipes, visit BarillaUS.com. Tennessee Truffle Bonanza. If Tennessee is lucky, Jack Daniels may soon be overshadowed by the Tennessee Truffle. After seven years, a plant pathologist has successfully grown the first large domestic crop of black Périgord truffles, Tuber melanosporum. Dr. Tom Michaels, of Chucky, Tennessee, is the first domestic truffle farmer to produce commercial quantities of truffles of a quality that commands top dollar ($50 an ounce, $800 a pound—about half of what this winter’s crop of Périgord truffles, shown in the photo at left, sold for). While we have not tasted them, they have received plaudits from top chefs including Daniel Boulud, Thomas Keller and Jonathan Waxman.But he is not the only one panning for black gold. Truffles have been grown in the U.S. before, but the quality hasn’t been at the same level of the Périgord truffle. Charles K. Lefevre, the owner of New World Truffieres in Eugene, Oregon, which supplies inoculated trees to about growers, reports about 300 truffle orchards in the U.S. Garland Truffles, in Hillsborough, North Carolina, supplies a similar quantity of inoculated trees. The benefit to consumers is that if even a small number of these orchards succeed, truffles will become more plentiful and their prices may become more affordable. While there are about 60 species of truffles, all of which grow underground, only a dozen have culinary value (i.e., taste good). 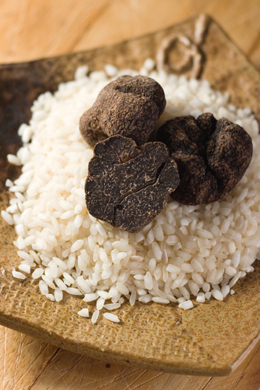 Read our article about the great truffles of Europe for more information about truffles. 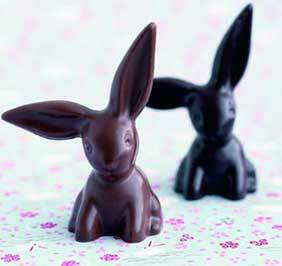 Vosges Bunnies Hop Into Town. Vosges Haut Chocolat’s cutting-edge chocolate Easter bunnies for adults, which invariably sell out each year, have just hopped in—this year in five flavors. Each solid chocolate, flop-eared bunny represents a different part of the world, and at 2.5 ounces is $9.50. Grown-ups and their gourmet offspring can choose among: Red Fire, a spicy dark chocolate with ancho and chipotle chiles and Ceylon cinnamon; Naga, milk chocolate with Indian curry and coconut; Black Pearl, dark chocolate with ginger, wasabi and black sesame seeds; Gianduja, milk chocolate with hazelnuts and almonds; and Barcelona, milk chocolate with hickory-smoked almonds and grey sea salt. Read our full review of Vosges chocolate bars. Mashti Malone’s New Flavors. We are unabashed fans of Mashti Malone’s amazing ice creams. We can never decide what flavor to have first. Now, they’ve compounded the problem with two incredible new flavors, Lavender and Turkish Coffee. Read our complete review of Mashti Malone’s Exotic Ice Creams and Sorbets. Izze To Introduce Low Calorie Line. In a palette of pretty pastels, Izze Beverage Company will be launching a low calorie version of their fashionable fruit beverages this summer: all natural, the low-calorie beverage is made with just sparkling water and real fruit juice. Half the calories of regular Izze, Izze esque is just 40 calories per 8-ounce serving. However, the bottle is 12 ounces, so the consumer can elect to do the math and drink the whole bottle for 60 calories, or do the math and leave 1/3 of bottle (i.e., half a serving) to finish at a later time—possibly with a half serving from some other bottle, if both remainders haven’t fizzed flat by then. We love nutritional labeling—we just wish the portion sizes were expressed in ways that made sense! Izze esque will be available in three flavors: Sparkling Black Raspberry, Sparkling Limon and Sparkling Mandarin. Functional Foods Fly High. Functional foods—now referred to as “Phoods” and “Bepherages”—are packaged foods and beverages that provide a positive pharmaceutical benefit beyond basic nutrition, due to the inclusion of medically beneficial ingredients. They may sound phunny, but they are growing into a huge niche market. An estimated $25 billion worth was sold in 2006 and the demand is projected at $39 billion by 2011, according to Functional, Fortified and Inherently Healthy Foods and Beverages: The U.S. Phood Market, a new report from market research publisher Packaged Facts. Phoods are seen as an excellent alternative delivery system for many of the nutritional supplements we already taken by supplement: The largest increases in functional ingredient demand are expected to be for nutraceuticals such as glucosamine, probiotics and sterol esters, whey protein, omega-3 fatty acids, and Co-Q10. Easter Egg Trends. Move over, pastel Easter eggs. Bold, bright colors are the current fashion. Purple is America’s favorite Easter egg color by an overwhelming margin (36%), while teal is a runner-up (17%) and denim blue not far behind (14%). Women prefer purple and teal; while men go for denim blue (19.5%), followed by green (12%) and red (11%). These were the findings of a national survey by PAAS®, makers of the leading egg decorating kit. Families typically dye and decorate between one to two-dozen eggs (60%), and nearly 75% use a few splashes of white vinegar to create a more vibrant hue. Beyond dye, in these bling-obsessed times, people like to get glitzy with their eggs! In fact, 9 in 10 families that purchase decorating kits choose one with embellishments (PAAS offers Speckled Eggs, Eggs-A-Glow and Sparkling Glitter). Almost 80% like a tie-dye effect, while 2 in 3 bring out their inner artist with food-safe markers and crayons. Other popular techniques include adorning eggs with stickers (58%) and adding “bling” with sparkles (42%). So, what happens to those colored eggs? The vast majority of responders (83%) eat them. Nearly 70% of families plan to use the eggs for Easter egg hunts; almost 65% display their egg art as decorations and 15% use the eggs as Easter gifts. Eleni’s 10% Discount. Whether you’ve got March Madness or just want to send a cookie gift, order any of Eleni’s assortments for delivery by Friday, March 23 and enjoy a 10% discount. Use promo code HOOPS07. Forget Those Red Tomatoes. Most of us are trained to grab the reddest tomatoes. But food scientists at Ohio State University in Columbus think that their special variety of orange tomatoes may be healthier than garden-variety red tomatoes. 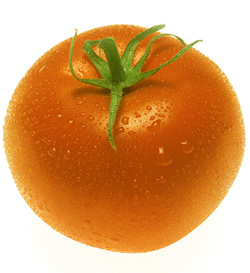 They say that the orange tomatoes contain a type of lycopene that is more readily used by the body than the type of lycopene found in red tomatoes. The antioxidant lycopene, which gives red tomatoes and other fruits and vegetables their rich color, is believed to have a number of health benefits such as reducing the risk of cancer, heart disease and age-related eye problems. Results taken from test subjects who ate tomato sauce from the orange tomatoes showed lycopene levels 2.5 times higher than those who ate red tomato sauce. Blood lycopene levels spiked about 5 hours after the orange tomato sauce meal and at this time the levels were some 200 times higher than those seen after the red tomato sauce meal. While red tomatoes contain far more lycopene than orange tomatoes, most of it is in a form that the body doesn't absorb well. Thus, one can eat far less orange tomato, but absorb bar more lycopene. The orange tomatoes used in the study were grown at an Ohio State-affiliated agricultural research center and are not readily available at grocery stores; but interested consumers should seek out orange or gold-colored heirloom tomatoes—although the scientists add that they haven’t tested how much or what kind of lycopene these varieties contain. Honey’s Benefit On The Waistline. The Journal of Food Science reports that weight gain is significantly lower from honey compared to other sugars. A researcher at Waikato University in New Zealand studied the effect of weight gain in rats from honey, sucrose (table sugar) and mixed sugars. Overall percentage weight gain was significantly lower in honey-fed rats than those fed sucrose or mixed sugars, despite a similar food intake. Weight gains were comparable for rats fed honey and a sugar-free diet even though the food intake was significantly higher in honey-fed rats. 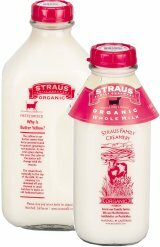 Straus Family Creamery Verifies No GMOs. Many people who buy organic dairy products don’t realize that the animals may have eaten feed contaminated with genetically modified organisms (GMOs). Certified organic crops are at risk of contamination by genetically modified crops; GMO crop contamination was ruled a violation of federal law in a case filed against the USDA, because it caused economic harm to both conventional and organic farmers. Straus Family Creamery has rejected organic feeds for their animals because of GMO contamination, and now, by teaming up with The Non-GMO Project, will be the first certified organic manufacturer in the United States to verify that all of its products are not contaminated by previously undetected genetically modified organisms (GMOs): The Project’s verification and compliance seal will appear on Straus product labels, ensuring customers that the products are verified as non-GMO. The Non-GMO Project is a nonprofit organization dedicated to providing access to non-GMO foods and supplements. Its mission is to provide consumers with the ability to purchase non-GMO products produced in compliance with a rigorous Non-GMO Project Standard. For more information about The Non-GMO Project, visit www.nongmoproject.org. Old Nick, the only British barleywine that’s easy to find in the U.S., a 7.2%, ruby-red libation made by Young’s Brewery. Ridge Runner, 7.2% alcohol, from Rock Art Brewery in Morrisville, Vermont. Old Foghorn, 8.8% alcohol, from from Anchor Brewing, San Francisco, the oldest American barleywine. Druid Fluid, 9.5% alcohol, from Middle Ages Brewing Co. in Syracuse, New York. Bigfoot, 9.6% alcohol, from Sierra Nevada Brewing Co. in Chico, California. Monster, 10.1% alcohol, from Brooklyn Brewery in Brooklyn, New York, aged four months. Chaotic Chemistry, 10.8% alcohol, from Magic Hat in Burlington, Vermont, aged for 36 months in bourbon barrels. Old Horizontal, 11% alcohol, from from Victory Brewing in Downington, Pennsylvania. Blithering Idiot, 11.1% alcohol, from Weyerbacher Brewing in Easton, Pennsylvania. Old Guardian, nearly 11.3% alcohol, from Stone Brewing in San Diego. 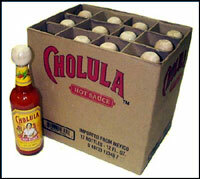 Cholula Hot Sauce. Tabasco® has “the name” among consumers, but fine restaurateurs often use Cholula Hot Sauce—a fact we were reminded of when we attended last week’s International Restaurant Show. While Tabasco is an American product (see our review in this month’s issue), For three generations, Cholula has been produced in Chapala, in the state of Jalisco, Mexico, the home of tequila (the sauce is named Cholula after the oldest inhabited city in Mexico, 2,500 years old and famous for its 365 churches.) The 100-year-old family recipe blends pequin peppers, red peppers and spices to create a nice balance between flavor and heat—unlike Tabasco’s original red Pepper Sauce, it’s not searing hear—you can taste the flavor of the chiles and the spices. But what we really liked about Cholula was the Garlic flavor. Delicious in dips, as a dip, Bloody Mary’s or shaken right on—we really like it. If you can’t find Cholula locally, you can buy it by the case—$23.75 for 12 five-ounce bottles, perhaps good for adult Easter baskets...or they’ll keep for stocking stuffers. More Japanese Ingredients—Hopefully. THE NIBBLE staff had the opportunity to attend a wonderful industry event last week, Flavors of Japan—A Gastronomic Discovery. In tandem with the New York Restaurant Show, great Japanese chefs Masahiro Kurisu, Motoi Kurisu, and Kenichi Hashimoto did inspiring cooking demonstrations—and unlike watching The Food Network, we got to eat a great dinner with some dishes never seen at a neighborhood Japanese restaurant. fresh soba noodles were made, and the fabulous wagyu beef flowed (yes, it is heavenly—it needs to be cut in very thin slices, in our opinion, and not served in big chunks like a strip steak). Chef David Bouley, who has studied extensively in Japan, prepared two dishes, one with yuba, a product made from soy-milk into large, noodle-like sheets that can be cut, wrapped, made into pastry. He wrapped it to create a scallop and foie gras “dumpling” and extolled yuba as an ingredient that could be powerful in America if only people knew about it...and if there were demand for importers to bring it in (or for producers to make it locally). Flavors of Japan had a thrilling pavilion at the Restaurant Show where we tasted dessert vinegars from two different producers—a concept we had had only once before from the great Brauerei Gegenbauer, perhaps the greatest producer of gourmet vinegar in the world. His Noble PX can be enjoyed in a liqueur glass at the end of the meal. Now, Japanese vinegar producers are doing something similar with their vinegars, adding flavors and making a delightful beverage. Given the health and digestif benefits of vinegar, you’ll appreciate how something that tastes so good is also good for you. We’ll be writing about this product in an upcoming Top Pick Of The Week. Many Americans love sushi and popular dishes like teriyaki, but great gourmet ingredients of Japan will hopefully become accessible to more of us soon. 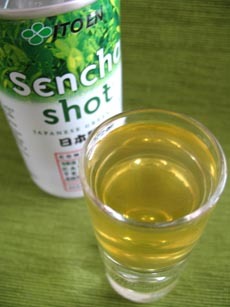 One thing that we are grateful to enjoy every day is our Ito-En Sencha Shot (photo above), a can of intense green tea, and several bottles of iced tea from Ito En (photo at right)—imported from Japan and the best bottled green tea in America, we think. We order it by the case! It feels like liquid health. Coincidentally, the Wall Street Journal reports that American manufacturers such as Kellogg Co., Campbell Soup Co., H.J. Heinz Co. and General Mills Inc. are pushing their products into Asian markets. In China, General Mills bills its Häagen-Dazs ice cream as a luxury product. Häagen-Dazs stores are sit-down cafes with ambience and music, where customers are greeted at the door and can order from a menu. A pint of Häagen-Dazs sells for as much as $9 in retail stores (“U.S. Food Giants Aim for Asia,” March 7, 2007). JavaPop: Organic Coffee Soda. Those who seek organic beans for their java can now have it in a soft drink, too. 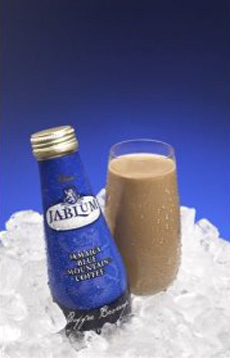 JavaPop, Inc., the creators of the first Organic, Fair Trade Certified coffee soda, is now available nationwide launch. A carbonated, non-dairy based, 100% natural coffee drink, JavaPop is sweetened with organically certified, pure cane juice. JavaPop’s 5 flavors include Caramel, espresso, Hazelnut, Mocha, and vanilla. Fair Trade Certification guarantees that the farmers who grow the coffee beans receive fair value for their crops, allowing them to maintain ownership of their land and invest in the quality of their harvest. 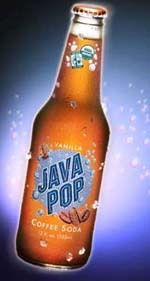 If there’s no JavaPop in your local store, use the contact form on JavaPop.com to find your nearest retailer. Coffee Tops Cola. Reversing a 16-year trend, American adults now drink more coffee than soft drinks on a daily basis, according to data complied by the National Coffee Association. Fifty-seven percent of the adult population is more likely to consume coffee drinks on a daily basis, whereas 51 percent of the same age group now consumes soft drinks daily. 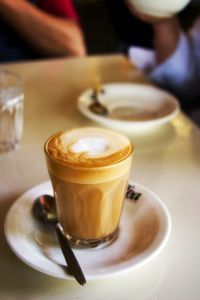 For the fourth consecutive year, the association found that coffee consumption among 18-24-year-olds is on the rise. Thirty-seven percent of participants in this age group said they drink coffee, up from 16 percent in 2004. The study also revealed that overall adult consumption remained at 82 percent in 2006, which itself was a record number last year. Weekly consumption for 2006 was recorded at 67 percent, a 1 percent drop from last year’s record high. The National Coffee Association's study has been conducted since 1950, and is based on a nationwide random telephone survey. A full report is slated for publication in the spring. One can guess that the trend trend to gather in ever-expanding coffee shop chains, and the fact that younger people have “grown up” in these chains, has contributed to the numbers more than a little. Buy This Fire Extinguisher! We had a small kitchen fire at THE NIBBLE this past week, and wished we’d had one of these new extinguishers from First Alert®. Since few people actually “test drive” their fire extinguishers (and since we are New Yorkers, without yards, driveways, or other outdoor spaces to test them in), we’d looked at our extinguisher but never tried to “pull the pin” or “discharge” until we had an actual fire. Then, we couldn’t figure out how to make it spray! Evidently, we’re not the only ones. The new Tundra™ Fire Extinguishing Spray is designed for consumers looking for a safety product that is easier to handle during an emergency: It works just like any aerosol spray, so even a child will know how to use it. The size of a large aerosol can, it is effective on common household fires including paper, fabric, wood, cooking oil and electrical fires. It should be kept on the counter at all times, right next to the stove—so when a fire breaks out, valuable time isn’t lost looking for the extinguisher. First Alert® advises consumers to call the Fire Department and evacuate others from the premises before attempting to put out any fire. Tundra is available at national retailers such as ACE Hardware, Costco, Home Depot, Independent Hardware/Lumber Store, Kmart, Target, True Value and Walmart for about $20. We plan to buy one for everyone on our Christmas list, but don’t wait until then to safeguard your home. You can learn more about Tundra™ at FirstAlert.com. Calcium is an important component of a healthy diet, essential for strong bones and teeth, and minimum requirements must be met throughout a woman’s life. Vitamin B folate (folic acid in fortified foods) helps women of childbearing age reduce the risks of birth defects. It may also lower heart disease and dementia risks. Vitamin D promotes absorption of calcium and may also have cancer-fighting qualities. Ongoing research suggests that tea contains antioxidant properties that can help protect against a range of cancers. Research also suggests that tea can increase endurance during exercise by improving fat metabolism and may help the body’s immune system response and boost mental alertness. Nutritional Iced Tea For Women has a suggested retail price of $2.99 per 12 fluid-ounce bottle. 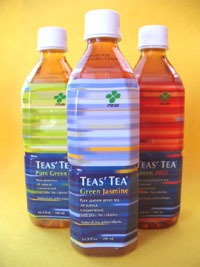 The product is available nationwide at select natural and specialty food stores, and online at RepublicOfTea.com, and at 1.800.298.4832. Mary’s Still Crackers. 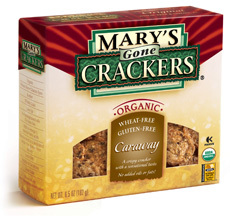 Mary’s Gone Crackers’ Original Seed Cracker, reviewed by THE NIBBLE in 2005, has become the fourth best-selling item in natural foods stores across America after only two years on the market. While the cracker category is very competitive, the gluten-free, organic and kosher product is absolutely delicious, combining flavor and crunch with ingredients that are “so textbook healthy they’re almost scary,” says the manufacturer: organic brown rice, organic quinoa, organic flax seeds, organic sesame seeds, organic wheat-free tamari, filtered water and sea salt. Read our review of Mary’s Gone Crackers’ full line, and you may go Crackers too. More “Ethical Foie Gras.” Well, not exactly foie gras, because these geese are not force fed—but their livers (foie) are nice and fat (gras)! 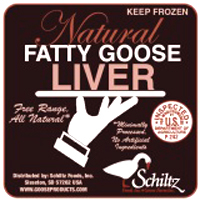 Like the product we reported on last week (Ganso Iberico, produced in Spain from birds that have eaten naturally), Schlitz Foods, a Long Island goose farm, is selling a Natural Fatty Goose Liver. Though the liver is 1/3 the size of a force-fed liver, it cooks up the same way. You can purchase it at RoastGoose.com. While you’re there, look at the Smoked Goose Breast. It can be sautéed and served as a smoky, lean and delicious substitute for bacon. It’s terrific. The Savories: Foie gras, served with French toast and a spiced chocolate ganache; a hand-harvested scallop, cocoa-dusted, with grapefruit and spinach; lamb loin with Spanish mole, served with black olive and roasted carrot; and striped bass served with potato ravioli and a chocolate and saffron emulsion. The Sweets: Chef Mark Gold’s family chocolate egg cream recipe; a chocolate tasting, featuring an international selection of chocolates; Coco Choc—chocolate liqueur, B&B brandy and a shot of iced espresso; Divine Decadence layered with Chambord, Godiva chocolate liqueur and Baileys; and a chocolate martini—dark chocolate liqueur and vanilla-infused vodka with a cocoa powdered rim and a brandy-soaked cherry garnish. Enjoy the Foie Gras recipe, courtesy of Chef Gold. The Vive Le Chocolat menu will be available until March 14 at Leatherby’s Cafe Rouge in Costa Mesa. For reservations, call 1.714.429.7640. What We’re Drinking. While carbonated beverages and milk remain the two largest categories purchased by consumers, they were the only two of the top 10 largest consumer products categories to show sales declines last year, according to an Information Resources, Inc. (IRI) report, “2006 CPG Year in Review.” While declines of 0.1% and 2%, respectively, may not sound massive, they translate into many millions of dollars in sales and send up a red flag to producers. Sales of beer, the third-largest consumer products category, also are declining in the domestic, big-brand category. Overall beer sales rose by just 2%; however, at the high end, microbrews were up 16.9%, and imported brands up 10.9%. What are we drinking instead? Ready-to-drink tea and coffee (including bottled and canned) took top honors in sales growth, with an enormous 28.2% increase. Sales of bottled water, which ranked tenth among the top 10 categories by total sales, jumped 12.3%, making it the third among top-growing categories for 2006. Sports drinks ranked fourth (up 11.8%), and wine ranked fifth (up 9.3%). Whole milk sales, once a sacred cow in America’s grocery basket, dropped 6.5%; skim/lowfat milk sales were flat. However, milk substitutes are thriving: the groups that includes Kefir and milk substitutes like soy milk, and the packaged milkshakes and non-dairy drinks group rose by 7.7% and 6.3%, respectively. IRI attributes the upswings in sales of coffees/teas, sports drinks and bottled waters to consumer perceptions of health benefits associated with ingredients such as ginseng, green tea and white tea. Since product innovation in these categories is high, the company foresees even more momentum in 2007.